“Todd does a wonderful job making the lessons interactive and engaging.” Comment by host of a recent event. What are the Guidelines for Travel Budget and Arrangements? Which of Us Should Handle Reservations? Other Notes, Questions or Comments? Todd R. Christensen has made a life of educating and helping others live debt free. Contact us to schedule him for your event today! Looking for an energetic and compelling speaker for your upcoming conference, meeting, or event? Todd Christensen and his team of financial educators have a passion for improving the lives of others and are ready to share their extensive financial knowledge tailored to any audience in most any setting. Read on to learn more about their mission and in what ways their workshops can benefit you. I will give you my very best effort to make your event a success and help you reach the objectives you’ve set. Your success is how I measure my success. Prompt, professional replies to your online inquiries and your phone calls and email messages. A personal phone consultation with me and/or a member of my team prior to your event, in order to put together the best program for your audience. A customized presentation prepared and delivered (typically 60 minutes in length but available between 15 and 90 minutes) with energy and professionalism in order to achieve the objectives you’ve identified for your event. A customized online page on my blog for your event and your attendees that includes my presentation materials and links to relevant books, articles, and other resources I’ve put together or produced. A telephone debriefing after the event with myself or one of my team members, to address follow up requests and to ensure your event expectations were met. Todd presenting at the Smart Women, Smart Money conference. 2018 marked his third year participating in the annual event. As an Accredited Credit Counselor and author of Everyday Money for Everyday People, I have a decade of experience speaking as a personal finance expert for large and small groups. I have facilitated nearly 900 presentations, classes and workshops for thousands of participants, been interviewed for television shows, newspaper columns and magazine articles, and have served in financial literacy leadership positions across the country. Since 2004, I’ve served as Director of Education at Debt Reduction Services Inc, a nationwide nonprofit credit counseling agency. As Author of Everyday Money for Everyday People (2014), I also develop educational programs and produce materials that teach personal financial skills and responsibilities. I have in the past served as president-elect of the Idaho Jump$tart Coalition, chair of the Ethics Committee for the Association for Financial Counseling and Planning Education, and as a member of the Council for Certification of the American Association of Family and Consumer Sciences. I am currently serving as the board of directors secretary for Association for Financial Counseling and Planning Education and am a member of three coordinating committees of affordable housing authorities. Additionally, I hold two Masters degrees, including Master of International Management. Whether speaking to large groups (such as to 600 women at the Smart Women Smart Money conference in Boise, ID in 2012, 2014 & 2018) the general session of annual conferences (such as to 250 members of the Association for Financial Counseling and Planning Education in Jacksonville, FL in 2011) or school classrooms and small business employee training meetings, I take great satisfaction and professional pride in inspiring others to make financial changes for the better in their lives. I have published articles and booklets addressing topics ranging from marriage and money to raising financially smart children, from recovering from bankruptcy to controlling holiday spending. I also served in 2009 as a volunteer Spanish and French language interpreter at the Special Olympics World Winter Games in Boise, in 2008 as an evaluator of the Pre-Professional Certification Test for the American Association of Family and Consumer Sciences and have served frequently as a financial education awards judge for various conferences and associations. In 2007, I helped to draft the course standards for Idaho’s Mathematics of Personal Finance high school course. An eagle scout myself, I have also served in multiple adult leadership positions in scouting. 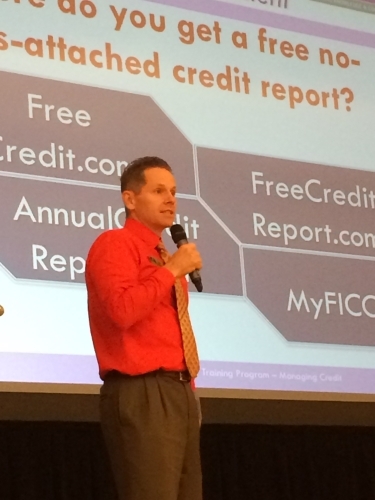 Todd teaching people how to access their free credit report at a recent event. Here’s a sampling of the possible presentation topics. Remember, if you don’t find what you are looking for, we’d be happy to customize your workshop content, just ask! Great for the general audience, from teens to seniors, beginners to the rest of the 60% of Americans living paycheck-to-paycheck (or worse). This presentation addresses Values, Generosity, Expense Planning, Credit, Debt and Savings. By the way, HOW do you move your household budget from Friend to Frenemy? And WHY does good credit still matter, even if you’re not buying a new home anytime soon. Like our Everyday Money for Everyday People presentation, but for Zombies. Get it? Financial Zombies, like the rest of the undead, wander about seeking only to consume, without apparent reason or rationale, and are never satisfied. But is it possible to bring one back from the financial undead? There is always hope! Credit is one of the least understood topics related to personal finance, yet still one on which we tend to fixate as a society. This enlightening presentation reduces this complex topic to a single word while also providing details of what to look for on your credit report and what the most influential factors are of a credit score. This surprisingly enjoyable and insightful workshop provides practical, “how to” advice and tips for dealing with current debt and for identifying signs of impending financial challenges in just about any household.Find motivation and feel empowered to take (back) control of your finances by envisioning a practical and achievable debt free existence without complicated theories and forced lifestyle changes. Unemployment, along with impossibly high medical bills and divorce, tops the list of household financial crises. While these situations are extraordinarily challenging, all hope is not lost. Learn what you can do before, during and after unemployment to improve your chances of short- and long-term financial recovery. Whether they result from accidents, short-term illnesses, or chronic conditions, medical bills from hospitals, doctors, and service providers can seem like a blow to us when we’re already down. Learn your options, with or without insurance, for minimizing the frustration and for maximizing your long-term financial recovery. This fun and insightful workshop begins with a brief 30-question self-evaluation of each our own spending personalities (yes, most of us have a multiple spending personalities, and that’s okay). Together we’ll identify six major spending tendencies and motivations to which we may be susceptible. Each is assigned a color and discussed in depth. There’s not necessarily one color to which we should aspire over another. Rather, each color is a part of us throughout our lives. However, some colors do present greater enticements for overspending than do others. The foundation of our legacy series of personal finance seminars, this workshop employs a new, fun and practical approach to everybody’s least favorite financial topic: Budgeting.• Why don’t most people know what their annual net income is and why is this so critical? • Why are $1,000 house or rent payments easier to make than a $800 car repair bill? • What key step is missing from virtually every single household budget that fails? • What are 5 myths that non-budgeters use to justify their lack of attention to their finances, and what are the realities that debunk these myths? • How can two otherwise rational adults (spouses) sit down together and discuss finances without coming to verbal blows? See more presentations and access our webinars here.